Background: Holden is an English surname which was first taken from the same English place name. It is made up of the Old English elements 'hol' (deep, hollow) and 'denu' (valley). Mainly Lancashire, habitational name from places in Lancashire and West Yorkshire. Motto: Nec sperno, nec timeo; I neither despise nor fear. 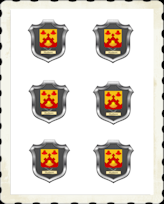 Arms: Argent, six alerions three, two, one, gules. Some an escutcheon gules, in the centerpoint. Crest: A double headed Alerion, gules. This is an English medieval surname. It is locational and probably originally from the places called Holden in the counties of Lancashire and West Yorkshire, although similiarly named places may have existed elsewhere in the country. The derivation is from the Olde English pre 7th century words "hol", meaning deep, and "denu", a valley; hence, "deep valley". Locational surnames were developed when former inhabitants of a place moved to another area, usually to seek work, and were best identified by the name of their birthplace. Topographical surnames were easily created, as both natural and man-made features in the landscape, provided recognisable distinguishing surnames in the small communities of the Middle Ages. The early surname development includes William Holeden of Sussex in 1327, and Richard atte Holdene of Kent at the same date. Other early examples taken from early surviving church registers include Sarah Holdren, christened at St Dunstans in the East, Stepney, on May 7th 1689, John Holdron, christened at St Bartholmew the Great, city of London, on February 24th 1709, and Moses Holden (1777 - 1864), an astronomer, who constructed one of the first magic lanterns. The first recorded spelling of the family name is shown to be that of Robert de Holden. This was dated 1285, in the Assize Court rolls of Lancashire, during the reign of King Edward 1st of England, 1272 - 1307. Name Variations: Holden, Holdin, Houlden, Houldin, Howlden, Holdren, Holdron, Holeden, Holdene, Holh, Denu.